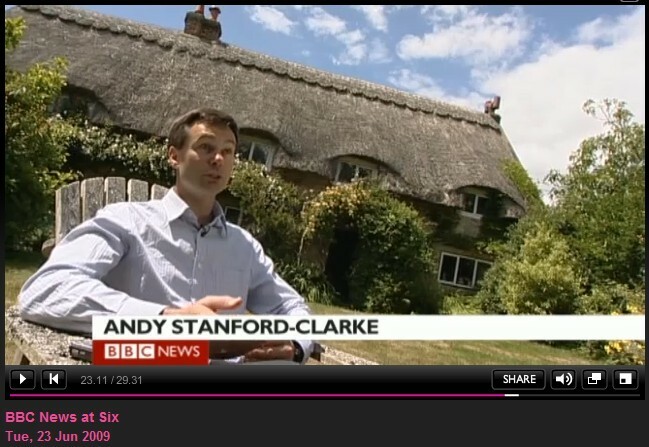 Superbly geeky news item on BBC1 last night, with @ruskin147 interviewing @andysc in his auto-tweeting home. Stanford-Clark describes an 'Internet of Things' where millions or maybe trillions of things are all broadcasting their own bit of data, and these data are used to inform users and make bigger decisions. Rory Cellan-Jones describes other auto-tweeting devices such as a ferry and an observatory. I don't think this report will do a lot to push Twitter into the public domain - yet - and it will be a slow awakening to the vast possibilities of micro-monitoring. The IPlayer version is available for a short while at the BBC. The Daily Mail has caught the story too, with an article called Now even houses can 'tweet'... as homeowner wires his cottage to Twitter. For those of you really interested in what Stanford-Clark's house is doing, go to @andy_house and send a follow request. @andy_house has typically had fewer than 30 followers, but now it has over 300 (updated 25 June 2009).